You’ll no doubt have noticed these fluffy creatures adorning the postcards of the Hautes-Alpes and their cuddly-toy counterparts welcoming you into souvenir shops with their high-pitched whistle. Once a key source of meat and fur for local inhabitants, today these animals have become somewhat a tourist attraction and mascot of the region. 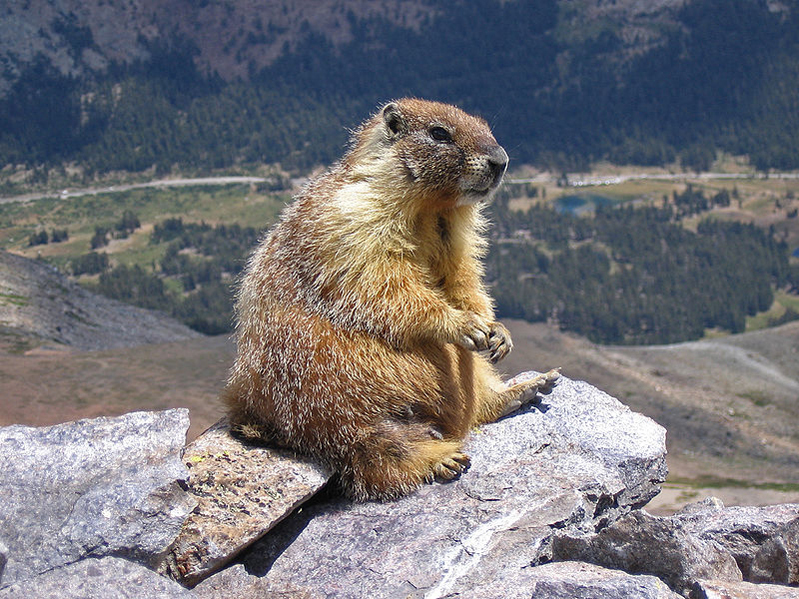 Marmots are protected in the national parks, the nature and hunting reserves of the region and in these territories, they can often be observed at close quarters. A species unknown in the UK, marmots are essentially large ground dwelling squirrels, similar to the American Groundhog. Six different species of marmot can be found spread across the globe from Europe, to Asia and America, all in the northern hemisphere. In France, the natural repartition of the alpine marmot is limited to the mountainous part of the Alpine regions, more often than not at 1000m + of altitude. Burrow digging is one of the principal activities of the marmot. This is not surprising given that these animals spend over half their lives in these underground havens! The burrows are a retreat for sleeping, mating, birthing, escaping and hibernating and their construction and maintenance are crucial to the life of the colony. Equipped with long hard nails on their front paws and strong hind legs for pushing debris out of the hole, marmots do not create a single burrow but a network of galleries and warrens. The principal gallery measures between 3 and 10 m long with a diameter of around 15cm, the entrance often situated under a large stone. In the network of galleries in this underground habitat, the marmottes guide themselves with the aid of their long whiskers. Marmots live in family units, and form colonies with neighbouring families. They recognise each other by odour according to a rite always respected which consists of sniffing each other on the cheek. Glands secrete an odorous liquid which allows each family to recognise one another, to limit boundaries of living space and also helps to preserve the unity of the community. Each family group possesses its territory, with its own trails, look out posts, burrows and food stores. From the autumn, their time spent sleeping grows and activity decreases. Active time is spent collecting dried herbs which are used to cover the floor of the burrow for the winter. One after another, the marmots fall asleep tightly curled into balls next to each other, with their heads lodged between the hind legs. The entrance of the warren is blocked with earth and grass. At the start of October, a long winter sleep (6 months) provokes great physiological changes. Their body temperature drops to just 4 degrees Celsius and respirations and heartbeat slow considerably. Life is maintained thanks to the accumulation of fat reserves and at the end of this hibernation period, they have lost almost half their body weight. The reveille of these herbivore mammals coincides with the growth of vegetation from April at the start of spring time. They gnaw and graze, thanks to their powerful dentition (4 long incisors, 18 premolars, and molars) and at the end of summer; the adult marmottes weigh around 5kg, sometimes more. They have doubled in weight in a few months and are now ready to take on a new winter season. A single powerful cry and all the marmots scamper back into their burrows – a predator is on the hunt in the vicinity! Thanks to their constant cries, the marmots warn each other of the presence of intruders (fox, dog, man). The whistles continue for as long as the intruder is present in their territory. Marmots can be hunted like many other mountain animals, though thankfully, the trapping and digging up, once practiced, are now forbidden. In times past, the marmot was highly prized for its flesh, and eaten roasted or stewed. The fur was also valued and was used to make jackets and coats and its fat was transformed into oil, reputed for its ability to heal hematomas and rheumatism. Listen, watch, be discreet and above all, be patient! One of the best places in the Hautes-Alpes to see these creatures in their natural habitat is in the remote Alpine village of Prapic, just a few kilometres from the ski resort of Orcières 1850. Situated at the gateway to the Ecrins National Park, the village is the starting point for numerous walks and treks where, fingers crossed; you will get a chance to see this Alpine animal scampering and whistling across the mountains in its natural habitat.